Many users think that GPS-enabled technology is a great way to track the location of their vehicles and that’s about it. While this is an extremely useful feature of many fleet management software programs, it certainly isn’t the only advantage. It is, in fact, just scratching the surface of what you can do. When you really start to dig into the power of GPS-enabled technology with your fleet, it’s pretty amazing what can be done. One powerful feature of fleet management software such as Fleet Command is geofencing; it’s also one of the features that are most often underutilized. This technology offers a number of advantages that can help you improve safety, reduce costs, and increase productivity throughout your fleet. For those reasons, it’s a technology that is worth learning about and understanding how to integrate it into your system. Once you do, you’ll wonder how you ever managed your fleet without it. 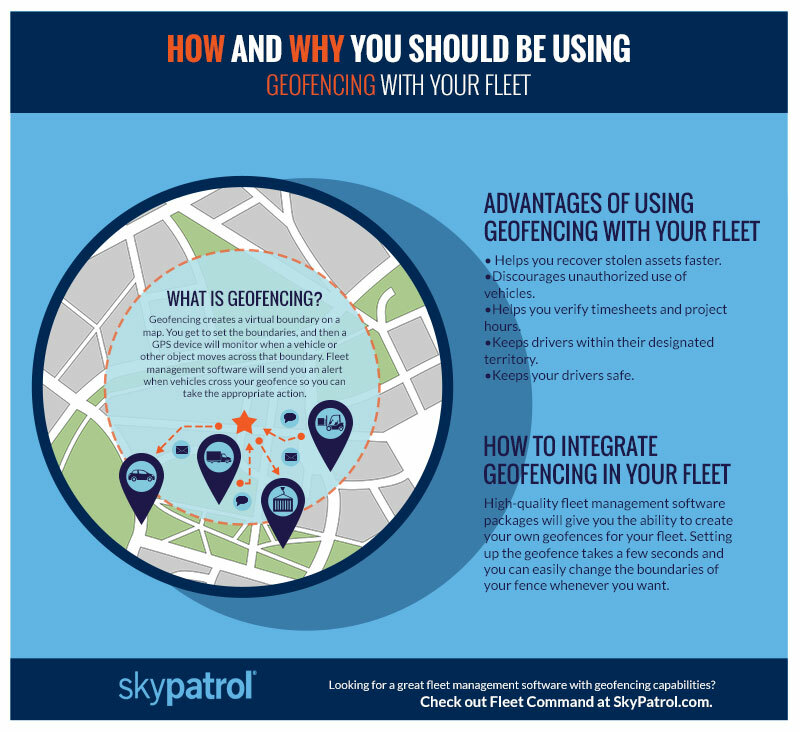 Geofencing is like creating a virtual fence for your fleet. You’ll create the virtual fence on a map, setting boundary points around a certain area. While the virtual fence cannot actually stop the physical vehicle, it does trigger an alert back to you so you know when the vehicle crossed that boundary. There are a number of ways to put this tech to work for your fleet. Your business depends on the vehicles within your fleet. Unfortunately, it’s a resource that can be a target for theft. The cost of that theft can be huge; not only will you need to replace the vehicle, you’ll be in danger of losing productivity and creating customer dissatisfaction. Every stolen vehicle can end up costing you tens of thousands of dollars. Geofencing can alert you to a vehicle going out of it’s set territory; that might be your driver’s delivery area or even outside of your company parking lot. Where you set the fence is up to you, but you’ll always know where your vehicle is at. Getting immediate feedback on your vehicles’ movements can help the police recover your stolen resources much faster, putting your vehicle back on the road where it belongs sooner. That helps keep your vehicle replacement costs lower and your productivity higher. Eliminate off-hours use of vehicles. Some companies allow their drivers to use company vehicles for personal use. Some do not. If you don’t, it can be difficult to monitor that after-hours use unless you are using geofencing. When you geofence your driver’s territory, you’ll get an alert about if, when, and where they’ve left that area. That alerts you to improper use of the vehicle and how long or far they went. Using a vehicle for personal use without permission can create huge issues; it could make your company liable in case of an accident, cause your insurance premiums to go up, and mean unauthorized fuel usage that could add up quickly. While the occasional errand might not be enough to get upset about, habitual use of a company vehicle for personal errands can start to become pervasive within your fleet and be costing your company big bucks. You can discuss driving habits with individual drivers and provide training, correction, and feedback to the worst offenders. Verify timesheets and project hours. Driver logs are essential when it comes to running your fleet. These logs show you when the driver started work, how long they spend on each project, and when they signed off at the end of the day. Unfortunately, hand-written logs are rife with issues. It’s easy for drivers to forget to make entries in their logs, and mistakes can be made. Some of these mistakes could be honest accidents, but others may be done in an attempt to steal time and money from the company. A geofence can help you verify the information given to you by your drivers. You’ll be able to see when their vehicle left your parking lot, when it arrived at a job site, and when it left. The depth of information that you can get from geofencing and fleet management software can actually help you eliminate driver logs altogether; that gives your team more time to work on the task at hand instead of spending time filling out their timesheet. That can increase your productivity without sacrificing the data that you need. Prevents vehicles from entering overlapping territories. A lot of fleets operate within particular territories. For instance, you might have salespeople with designated territories who you don’t want poaching from other team members’ territory. Or you might have a license to operate your fleet within a certain area and could face hefty fines if your drivers move outside of that space. You need to be able to monitor where your vehicles go in order to make sure they are staying within the territory, and geofencing is perfect for this. You can set up individual territories for each vehicle on your fleet. Once that is done, you’ll get an alert any time that vehicle strays outside of the geofenced area. This enables fleet managers to contact the drivers to make them aware of their error and fix it as quickly as possible. Driver safety is one of the number one goals for fleet managers. Geofencing is ideal for helping you keep in touch and provide nearly instant help for drivers who might be in trouble. Drivers are on the road for hundreds of hours and thousands of miles each month; this puts them at higher risk of accidents, carjacking, and breakdowns. Geofencing can help you monitor any suspicious movement of a vehicle, whether that’s wandering outside of a designated territory or being idle for a long period of time. These alerts can give you the information you need to get in touch with your driver to determine if they are in need of assistance, and if they are, give the responding authorities their exact location. It’s peace of mind for both you and your drivers that no matter where they go, you’ll be watching over them and can get them help no matter where they go. Working with a quality fleet management software like Fleet Command will give you the ability to use geofencing. You’ll be able to set specific territories for your drivers and then monitor them in real time, with alerts sent directly to you whenever they cross one of your geofenced boundaries. This gives you immediate feedback on driver behavior, safety, and vehicle use. It’s the ultimate way to monitor your fleet, keep your drivers safe, and increase productivity and profits. And the right software will make it easy to set up, monitor, and adjust your geofenced territories in just seconds. An incredibly, it’s just the beginning of what great fleet management software can do. If you’d like to learn more about the benefits, get in touch with the Skypatrol team today to schedule a demo. You can give us a call or contact us through our website to get started. A member of our team will contact you about scheduling a demo and showing you everything that our fleet management software can do for you.